The 2017 Automotive News Europe Rising Stars gathered together for a group photo following the awards ceremony. 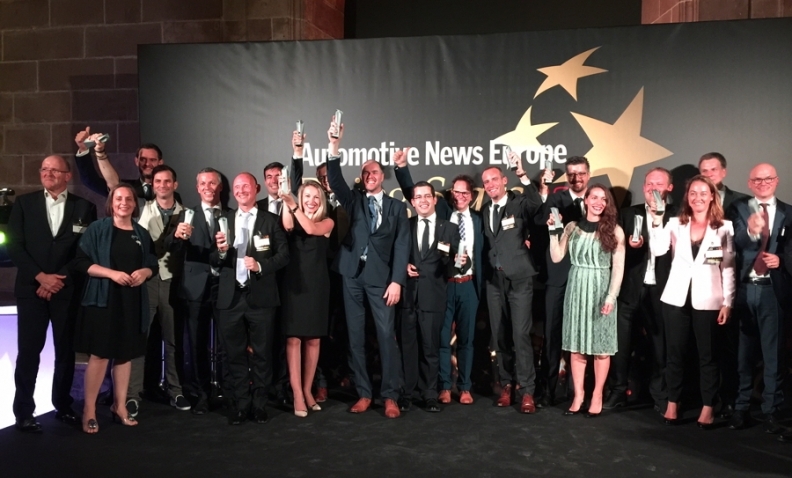 BARCELONA – Sixteen young and talented automotive executives have been selected as Rising Stars within the automotive industry by Automotive News Europe. A gala ceremony to celebrate the 2017 Rising Stars winners was held on Tuesday evening in Barcelona, Spain. The seventh annual Rising Stars awards recognize fast-climbing auto leaders who are already taking big steps forward in the industry. From automakers to suppliers, manufacturing to connected cars, engineering to sales, each Rising Star has spearheaded change and made progress up the career ladder. "These 16 individuals have the skills and the determination to lead the auto industry, which is changing at the speed of light and needs fresh ideas from young executives to overcome many big challenges," Automotive News Europe Associate Publisher & Editor Luca Ciferri said. "Several of our past winners have taken big steps forward in their automotive careers. We expect the same from this year’s Rising Stars award recipients." A Rising Star is an automotive executive with a pan-European profile who has driven change, fostered innovation and made courageous decisions. To qualify, candidates should have a minimum of 10 years of work experience, have multiple language skills and be 45 years or younger. Nominations are accepted from carmakers, suppliers, automotive service providers and retail/aftersales businesses.